The Archangel Michael as depicted on one half of a diptych of which the other half is now lost. It likely dates to the age of Emperor Justinian (6th cent.) in Constantinople when ivory figures were in vogue. It was inspired by a classical model. The inscription, which must have been completed on the lost panel, translates, “Receive these gifts, and having learned the cause....” This may have had something to do with Imperial power. - At Constantinople, Saint Michael the Archangel was considered the great heavenly protector and is said to have intervened in assorted battles throughout the history of the christianized Roman Empire. - His principal sanctuary, the "Michaelion", was at Sosthenion, some fifty miles south of Constantinople. This was established by Emperor Constantine I (324 - 337) after a vision he had of the Archangel. The sick slept in this church at night to wait for a manifestation of St. Michael and many healings were given. - Another famous church was within the walls of the city, at the thermal baths of the Emperor Arcadius (377/378-1 May 408); there the synaxis of the archangel was celebrated November 8. This feast spread over the entire Orthodox Church, with the Syrian, Armenian, and Coptic Churches also adopting it. It is currently the principal feast of St. Michael amongst Orthodox Christians. Although originating in Phrygia, its station at Constantinople was known as the "Thermae of Arcadius". - Other feasts of St. Michael at Constantinople were: October 27, in the "Promotu" Church; June 18, in the Church of St. Julian at the Forum; and December 10, at Athaea. - Emperor Justinian built four churches in Constantinople dedicated to the Archangel Michael. - There were nine Roman emperors with the name Michael who all had as their patron the Archangel Michael, beginning with Emperor Michael I Rangabe (811 - 813). Michael was the second most popular name to have ever been held by the imperial throne, with Constantine being the most popular (there were eleven emperors with the name Constantine). - When in Hagia Sophia, looking up into the splendid apse mosaic depicting the Virgin and Child; on the right is a partly damaged Archangel Gabriel mosaic. Gabriel used to face an Archangel Michael mosaic on the other side of the apse, but this is now almost entirely gone but for a few fragments. The mosaic dates from the second half of the 9th century, during the reign of Emperor Michael III (842-867) or Basil I (867-886). The figurative mosaic replaced a Cross mosaic from the Iconoclast period. - The Emperor Issac Komnenos (1057 - 1059) poured enormous sums of gold into embellishing a shrine of the Archangel Michael which stood north of Constantinople on the Bosphorus. Rare marble and bronze fittings were taken from other buildings for the church. New splendid jewelled and enamelled icons were commissioned by Issac from Roman goldsmiths. Rare ancient images were moved to the church by Imperial decree. All this was lost in the sack of Constantinople by the Fourth Crusade in 1204. Perhaps two of Issac's icons of the Archangel survive today in the Treasury of St. Mark's in Venice - loot from the Imperial City. - On a bronze door molded in Constantinople in 1076, the Archangel is depicted in the act of vanquishing the infernal dragon. - When Michael VIII Palaeologos (1261-1282) recaptured the city from the Crusaders, he erected a bronze statue of the Archangel Michael atop a pillar at the Church of the Holy Apostles to commemorate the event, and this towered a smaller figure of the emperor holding the city in his hands. He even commemorated the Archangel by placing him on coinage. - In 1328 a severe earthquake toppled the statue of the Archangel Michael which Michael VIII Palaeologos had set to commemorate the recapture of the capital by the Romans and the end of the Latin control. - During the late Roman period, he was occasionally represented together with the figure of the Prophet Daniel, who symbolized salvation for the faithful. The Romans typically represented the Prophet Daniel in "orientalizing" costume, such as a square hat, boots, and a mantle with a clasp. These signs indicated that the story of Daniel took place in Babylon, at the court of Nebuchadnezzar. The presence of the Archangel Michael and the Prophet Daniel on a single pendant offered its owner protection from spiritual and physical dangers. 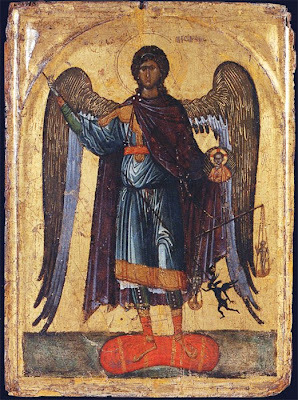 Icon of the Archangel Michael, Constantinople, twelfth century. Basilica di San Marco, Venice, Tresoro, inv. no. 16. Capital with marble bust of the Archangel Michael, ca. 1250–1300. Made in Constantinople, possibly from the Monastery of the Virgin Peribleptos ("All-Seeing"), now the Sulumanastir, a mosque. 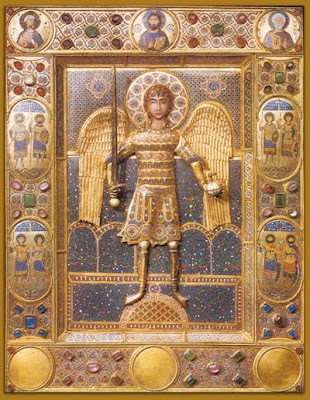 The Archangel Michael, who is identified by an inscription in Greek, wears a jeweled tunic and a diadem and holds both an orb and a staff. 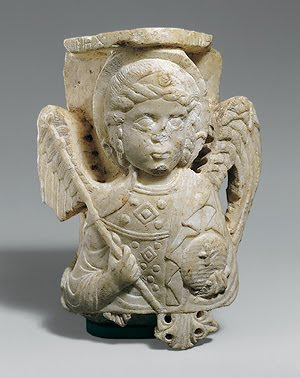 These elements of dress and attributes of authority reflect the long-established connection between archangels, who are the guardians of heaven, and the Roman emperor. This image may have been part of the decoration of the upper section of a tomb built into a niche. It is said to have been found near the ruins of the Monastery of the Virgin Peribleptos (All-Seeing), established in the early eleventh century by the Roman Emperor Romanos III Argyros (r. 1028–34), who was buried there. 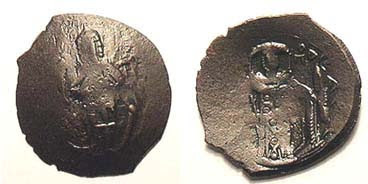 Coin minted in Constantinople depicting the Archangel Michael on one side and the Emperor Michael VIII on the other. 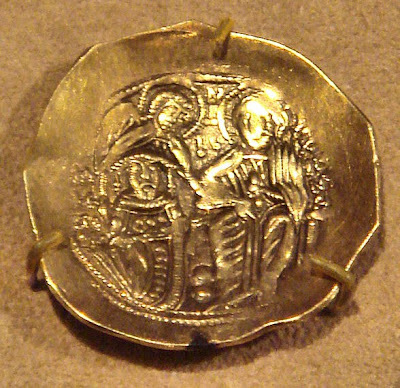 Gold hyperpyron of Michael VIII Palaeologos, shown (bottom left) kneeling before Christ (right), under the injunction of Archangel Michael (top left). Late 13th Century; Museo Nationale di San Matteo, Pisa. Here we see Michael carrying a medallion of Christ in his hand. The angel also holds a scale on which we see a human soul in the balance. The demon attempts to pull the scale down but Michael uses his wand or spear to stop him. The icon is painted in early Paleologian style. The heavy modelling of the figure, flashing highlights and classical proportions of the icon place it soon after the reconquest of Constantinople by the Emperor Michael Paleologos in 1261.